Today I have a list of scam free jobs based on making deliveries, errands, and driving. I know it’s a bit different then the normal “making money online” sites that I review, but these are some online based companies that will pay you to work locally. All of these jobs are legit, it’s just finding what’s popular in your area and what type of work is right for you! Before we get started all of these sites have requirements and an application process. These aren’t jobs that you can sign up for and start working today, but once your accepted all are pretty flexible and can be a good way to make some extra income in your free time. If you don’t live in a large city, these jobs won’t be available to you, just check out these ways to make extra income in your spare time! Earning an income driving and deliverying is great, but I prefer a much more passive method to make an income online, check out My #1 Recommendation, it’s how I made over $13,000 online last month! Below you’ll see all 11 jobs with a short job description, link to their application, and my full review. If a job sparks your interest you can visit my full review to learn more about the opportunity. Get paid to complete jobs like taking pictures of auto accidents or checking out a car someone would like to buy. Jobs start at $25 and some pay up to $200. Only available for college students. Get paid to complete “missions” like moving furniture, editing papers, and really anything clients want! Each Mission pays different, most seem to range in the $15-$100 range! Available in most major US cities. Get paid to complete tasks and make deliveries like going to the grocery store, picking up mail, cleaning, and much more. Most workers say they earn $10-$20 an hour! Get paid to go pick up groceries and deliver them to local clients. Available in most major US cities. Most members say they make minimum wage to around $12 an hour. Sign up for shifts in your local city. Make food deliveries from local restaurants to your client’s work or home. Guaranteed $10 an hour, some members make $20 an hour based on location. Get paid to pick up groceries, deliver food, and basically pick up anything and deliver it to local clients. Most members say they average $10-$15 an hour. Sign up for shifts as a helper. During these shifts you’ll pick up groceries and deliver food to client’s work or home. Some members report making around $22 an hour, seems like most are making around $10. A company almost everyone has heard of. Probably the most popular of the sites listed. Get paid to drive in your local city, when you’re available. Earn a cut of each client you drive, customers can request rides through the app, and payments are done through the app. Most members drive their own vehicles and report making $10-$20+ an hour! Basically the same as Uber, just another popular competing company. Most members drive their own vehicles and drive when they’re available in their local city. Clients can request rides and payments are done completely through the app. Most members report similar earnings to Uber $10-$20 an hour, but some report earnings of $35 an hour or more. Get Paid to deliver packages in your own vehicle. Use the app to find local delivery jobs, go pick up the package, deliver it, and get paid. Listed this under driving because deliveries require you to have your own vehicle and drive a good distance. Drivers report making $10-$20 an hour on average. Work whenever you’re available as long as there’s deliveries to be made! Get paid to give rides in your personal vehicle in your local city. The app matches people needing rides to drivers. Take the client where they need to go and get paid for it. Similar to Uber and Lyft where everything is done inside the app. Most drivers report making $10-$20 an hour, but some drivers say they make more. 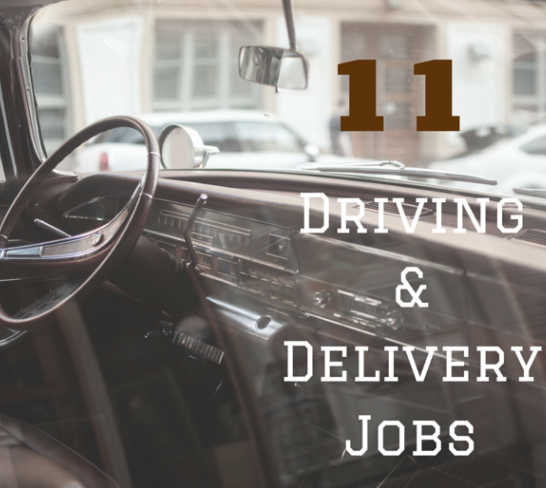 There you go, 11 different delivery and errand jobs that can help you make some extra money in your free time. Really all of these sites require you to have a vehicle, drivers license, and at least 18 years old. These sites are location-based so if you’re wondering if it’s available in your city just click my full review to see what cities are available. Also these sites have an application process, so if you’d like to join just visit their website and start the application process. If these jobs don’t seem to be right for you, I have a lot of other ways I recommend to earn some extra income in your spare time. Some of you might even be interested in working from home and making a full-time income. Check out My #1 Recommendation, it’s how I made over $13,000 online last month! Have you tried any of these delivery jobs? Think these sites are scams? Let me hear your thoughts in the comments below!